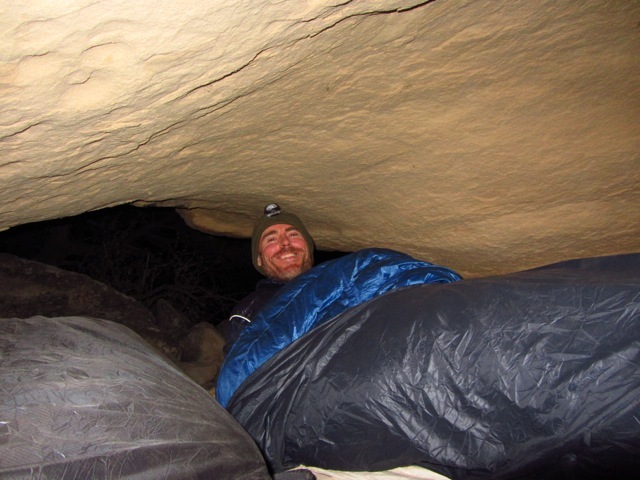 Katabatic Sawatch combined with Katabatic Bristlecone bivy | Cave just outside of Young’s Canyon | Southwestern Horseshoe, Utah, 2012. Since 2011, I have used two sleeping quilts on all of my backcountry trips. They are the Katabatic Palisade 30°F and the Katabatic Sawatch 15°F. Below is my long term review for both products. Time: More than 600 nights in the field since the end of 2011. Conditions: During this period I have tested both quilts in a wide range of environments including: calendar year Triple Crown in 2012 (i.e. I took the Palisade on the PCT & CDT and the Sawatch on my late Fall/early winter hike of the AT); the high alpine regions of the Peruvian & Colombian Andes, and; the climactically unpredictable Arthur Range of south west Tasmania. Click here for complete gear lists from all of the above mentioned trips. Fill power – 900 power goose down. Shell – Pertex Quantum Ripstop .85 oz/yd. Differential cut – The inner lining is sewn smaller than the outer shell to allow the down optimum space to loft. Neck collar. It has two buttons and a drawcord. Overstuffed. Toasty. Foot box: Also overstuffed. Trapezoidal shape. No hood (though you can order one separately); The lack of a hood is often cited as a reason for not using quilts. However, in my opinion it is no biggie. Why? Chances are I’m carrying a beanie most of the time anyway, and when added to the hoods I already have on my jackets (i.e. windshirt, down and/or rain), this is generally more than enough to keep my noggin warm. 1. Cords: Dual cords can be wrapped around your sleeping pad and clipped in at roughly shoulder and hip level (see photo below). These clips have two settings; a loose mode which is adjustable and a tight mode, which can be locked in for when temps get really nippy. 2. Webbing Straps: There are three in total. The top two are removable, the bottom one is fixed. Unless it is colder than a polar bear’s toenails, I generally go for the webbing strap option over the cords. My preference is to have the them directly underneath me, rather than wrapped around the pad. The straps are thin, unobtrusive and easily adjustable. 1. Minimizes/eliminates those bracing drafts, that have long been the bane of side sleeping quilt users (including yours truly) around the backpacking universe. 2. Keeps dead air space to a minimum. 3. Allows for freedom of movement. Click here for an overview of why I prefer sleeping quilts to bags. Katabatic Palisade | Pre-dawn start, Copper Canyon Traverse, Mexico, 2013. 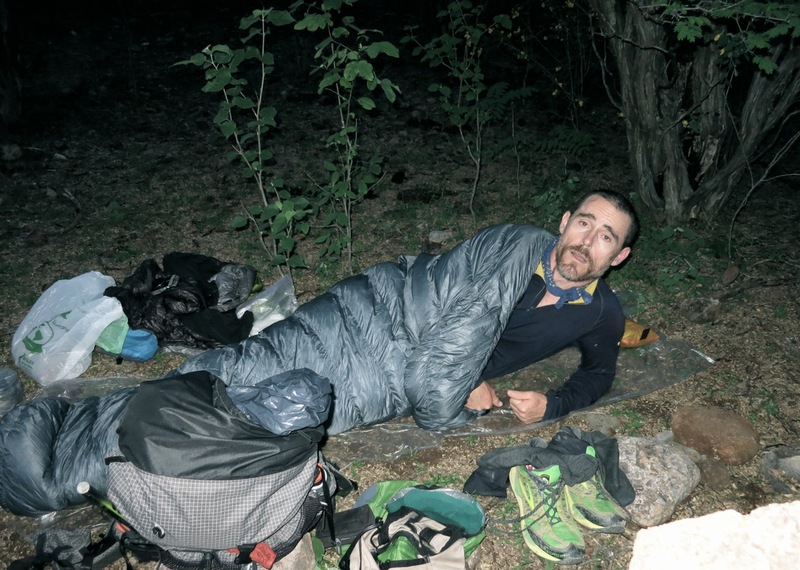 Sleeping bag ratings are subjective. Different people sleep warmer or colder at different temperatures. Over the years, I have found myself to be an average sleeper. Neither hot nor cold. In my opinion, Katabatic Gear ratings are conservative; unusual in a market in which some of its competitors exaggerate the warmth of their products. I have consistently used both the Palisade and the Sawatch down to temperatures that were 8 or 9 degrees colder than their listed ratings, whilst only wearing a medium weight merino wool base layer. When combined with a lightweight bivy (e.g. MLD Superlight or Katabatic Bristlecone) I have taken both quilts down a further 5 to 7 degrees and still been comfortable. I haven’t noticed any decrease in loft during the four years I have used Katabatic quilts. I generally wash them once a year. Katabatic Gear use high end materials. Their workmanship is first class. Their manufacturing process is entirely US based. Their quilts are not cheap. That being said, in my experience when it comes to down products, you get what you pay for. This pretty much holds true for any high quality gear made of goose down, whether it be jackets, vests, bags or pants. If it’s worth an extra $100 or so to have a top of the range quilt that will last you for years, then shell out the cash. If not, go with a slightly more affordable option from companies such as Enlightened Equipment or Jacks R’Better. Both of these manufacturers make excellent products, that rate as some of the best value for money lightweight quilts on the market. 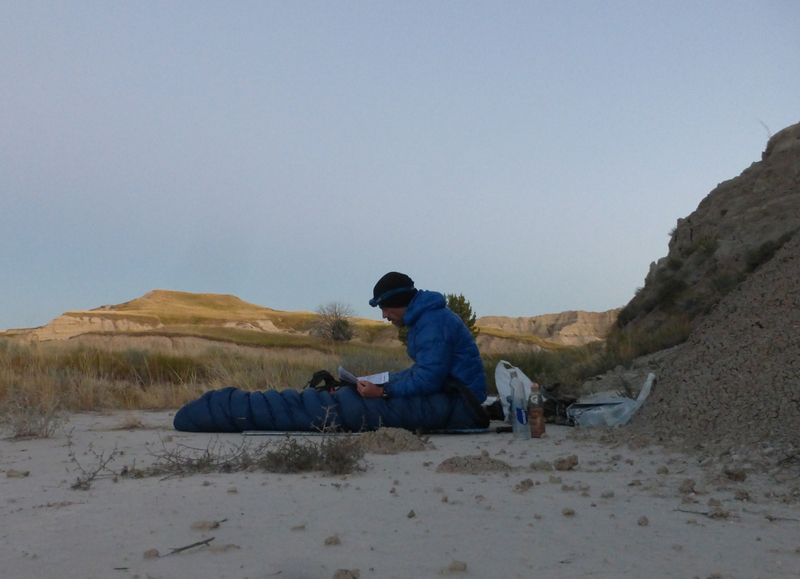 Katabatic Sawatch | Badlands Traverse, South Dakota, 2016. Highly recommended. 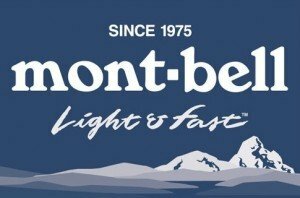 All-around the best sleeping bags/quilts I have used in twenty-five plus years of backpacking. Where can I buy kata attic gear in Australia? Congrats on all the ground you’ve covered since 2011. Quite impressive. I’m thinking about buying a Katabatic Palisade. (Have been using a Marmot traditional bag.) But I’m also intrigued by Katabatic’s 30-degree bag in the Flex line (because of the ability to unzip the footbox). Have you tried that out? Any thoughts about the two? Whether differential cut of Palisade makes a big difference? Thanks in advance. Thanks for the kind words. I haven’t had a chance to use the Flex line as yet. For all the lowdown from a comparative perspective, I think the best option would be to touch base directly with Aaron and Kris at Katabatic. Just from what I’ve seen on the website, they look like a good option for folks wanting a bit more versatility, with the bonus of saving a few bucks as well. I don’t know what I am feeling with my tent and sleeping bag bc it only take less than a week for me to get on my bicycle from la to Vegas and I need to not spend money so I can have money for prepare maybe PCT what do you think? 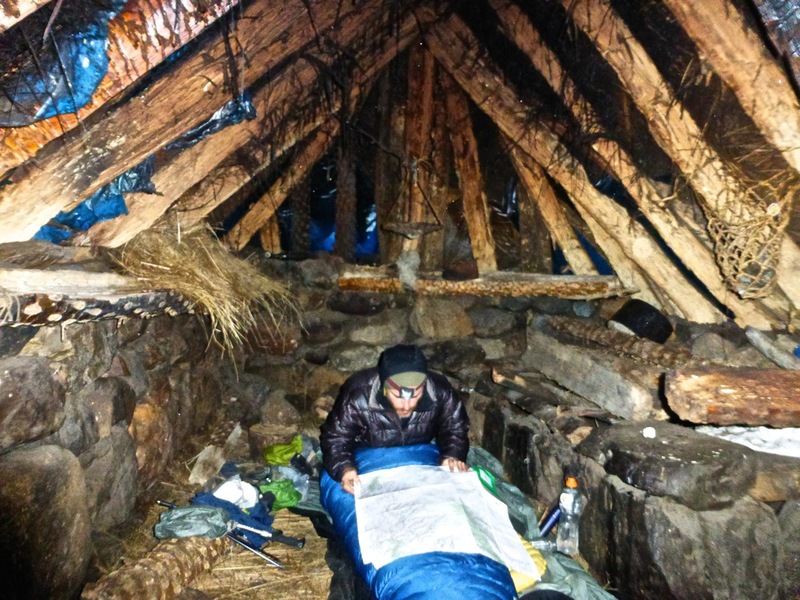 In regards to costs, as I mention in the article Katabatic quilts aren’t cheap. 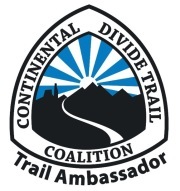 If you are trying to save money for the PCT, you may be better off going with one of the more affordable options such as Enlightened Equipment or Jacks R’Better. Hope this helps. I have the Palisade 30 and like it very much. My only criticism would be that it seems to lose down fairly easily. When I wake up there is almost always a feather(only one if i am lucky) floating around. I like to think I am not too rough with it. Do you stuff yours in a sack or keep it floating? Also I do not use the cords, I snap mine on just using the black attach points. It keeps me tight and toasty. The only place I sometimes feel a draft is above my tailbone/lower back but I usually sleep on my back so it’s not too bad. Any experience? Thanks for the message. I can’t say I’ve lost many feathers with either of my Katabatic quilts. In fact it’s rare that I wake up and find even one. I don’t put them in stuff sacks; instead employing them to fill the outer sections of my pack. As I mention in the article, I generally use the webbing straps rather than the cords. I’m a side sleeper that doesn’t toss and turn and haven’t had too many issues with drafts. If it’s chilly I’ll just cinch the straps up a little tighter. Cam, is your decision to go with 900fp over 850fp dwr treated based on weight savings? Do you feel that the 850 treated offers any measurable advantage? I’m considering buying a Palisade, but am unsure about which fill to choose. Weight and the fact that I’ve never found keeping my bag/quilt dry to be much of an issue. I guess if you do most of your hiking in rainy environments they would be the better option, however, if that was the case, I’d probably just opt for a synthetic model. Good point. I’d gotten some feedback from the web saying that 900fp tends to clump, which I hadn’t heard before. I just went with the 900 fill, and I’m hyped! Thank you. I’m loving your site. Glad Neon told me about it. How tall are you? I’m 5′ 11″ and 170lbs or so and wondering if long or regular would be better for me? Thanks! I’m 6’1″ and use the long. I’m a side sleeper who moves around a bit. I think you would be fine going with the regular. Cheers! Any tips on setting up the bristlecone bivy when it’s buggy out? It’s easy to tie it up to my tarp when that’s set up, but how do you keep it off your face when cowboy camping? Are there any tricks other than wearing a brimmed hat or being under a branch? Thanks! Not sure I can help with this one. When it’s really buggy I’ll usually just set up my tarp and tie it to that.